It’s already March, which means that most of the festival headliners have already been announced, and now the scramble for extra cash to scrimp together enough money to buy a ticket before they sell out is on. I personally love festivals. Okay, fair enough I have only been to Wireless and Reading, but they were amazing, and gave me some of the best memories of my life! The first festival I ever went to, was Reading in 2010, just for Friday, so I could see my favourite band (Guns N’ Roses) for the first time. As soon as I stepped through the barriers into the main arena I knew straight away that I would be back, and the next time it would be for the weekend. Since then, I’ve attended Wireless and Reading, both in 2012 and 2013. Even though I haven’t been to many festivals, I can very confidently say that the fashion is insane. Every year, magazines come out with their own features on “festival fashion”, which mostly just consists of crop tops with an annoying slogan, colourful (and usually expensive) sunglasses, short shorts that are frayed at the bottom, and a pair of Hunter wellies. I don’t understand why people are so concerned about what they wear to festivals, as it’ll just get caked in alcohol and mud. What is even more irritating, is taking expensive clothes/sunglasses/wellies to a festival. Again, it’ll just get caked in alcohol, and mud, and has the chance of being lost/broken/stolen. Last year, my friend Conor managed to lose a pair of wellies. Do not ask how, I’m not even sure he knows. At Wireless in 2012, I managed to lose a tenner, which is thankfully the worst that’s happened… OKAY so that’s a big fat lie, I did lose a Blackberry after having it for a week at Reading 2010, but it couldn’t be helped! I was near the front, in a circle pit, then got thrown into the middle… Honestly, if I hadn’t lost that phone, it would have been a miracle! Festivals are a great way to be a (slightly) cheaper version than a holiday. Camping with your best friends and listening to the most amazing music of the year honestly is one of the greatest ways to spend a summer weekend. A giant bonus is being able to witness the ridiculous outfits that people have managed to put together. I want to go to both Download and Reading, but I can’t afford to attend both. Actually, I can barely afford to attend one… I’d probably choose Reading over Download, because a) it’s a lot closer, and b) I have history with that place. Clearly. But, anyway, if you want to see me go to Reading this year (and let’s face it, who would NOT want me to go Reading this year?!) then please donate as much as you can to get me there! Or give me a job and pay me enough money so I can buy a ticket, and travel, and food, and alcohol for the weekend!! 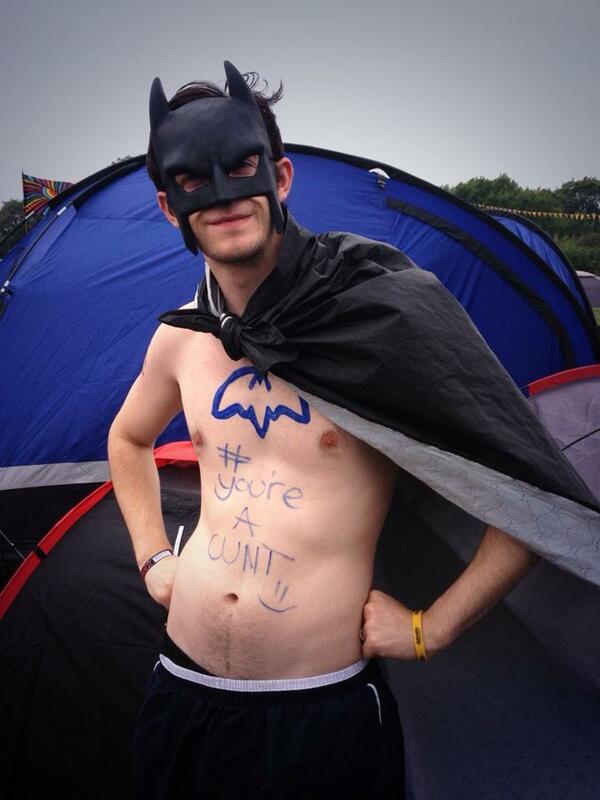 See, I told you I camped with Batman! Next > I’ve shaved my legs, now I can CONQUER THE WORLD!